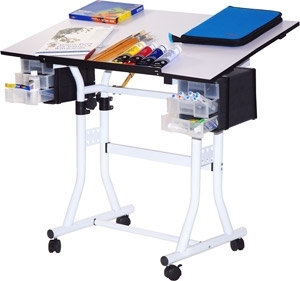 The Martin Universal Design creation station combines height and tilt adjustment, strength, stability, and convenience to create a workstation that meets all the creative needs of beginners, professionals, adults and children. One-hand tilt-angle mechanism adjusts table top from 0° to 45°. Height adjusts from 31" to 34" in the horizontal position (desk to drafting height). Set of four castors for easy moving, two of which are lockable for stable positioning. Table top dimensions — 24" x 40"